Quench your hair with exotic butters, nourishing oils and botanical extracts. See immediate results from the first use and leave hair more manageable, lustrous, and protected. 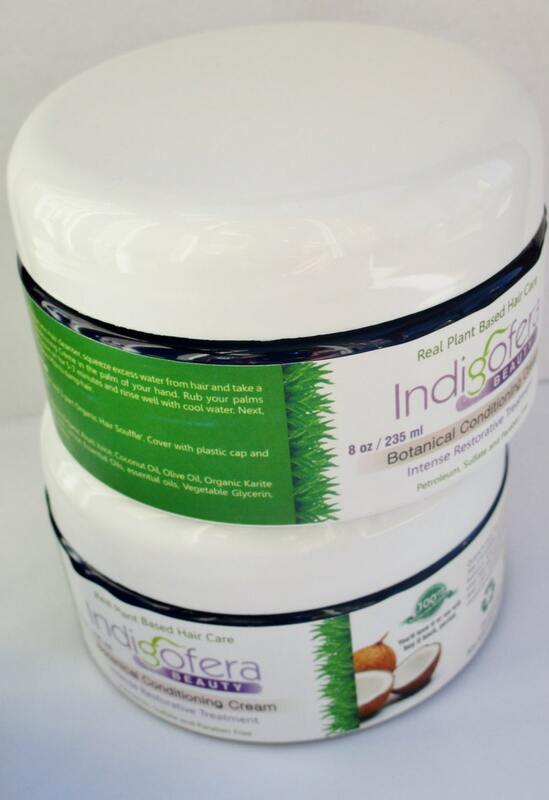 Indigofera's Botanical Conditioner is exactly what your hair has been waiting for! Pure aloe & coconut oil restore dry, damaged and color treated hair. Premium plant based emollients provide unrivaled moisture with no build up. •Coconut Provides Intense Moisture to the core of each hair fiber. •Pure Aloe Infuses Hair with Premium plant-based emollients. •Karite and Olive Protects Dry and Color-Treated Hair. After cleansing with Aromatic Hair cleanser, squeeze excess water from hair and take a half dollar size amount of Botanical Conditioning Crème in the palm of your hand. Rub your palms together and apply evenly to damp hair. Leave on for 5-7 minutes and rinse well with cool water. *"I absolutely love how this conditioner makes my locks feel softer than soft with no build up"
*For loose natural hair detangle with your finger or a wide tooth comb while conditioner is restoring. *Intensive Hair Mask Apply to hair, 3 parts Botanical Conditioning Cream and 1 part Organic Hair Souffle’. Cover with plastic cap and steam or heat for 25 minutes. Rinse well. Next, apply Nourishing Hair Souffle to damp hair. Aloe barbadensis (Organic Aloe) Juice, Coconut Oil, Olive Oil, Organic Karite Butter, essential oils, Kosher Vegetable Glycerin, Emulsifier, Thickener, Essential Oils paraben free preservative. Convo me with questions. I am happy to help. Natural Hair Care Sample Set. Best Seller. 7 piece set Free Shipping. Deluxe Natural Hair Care Ritual Set. Best Seller. 7 pieces.